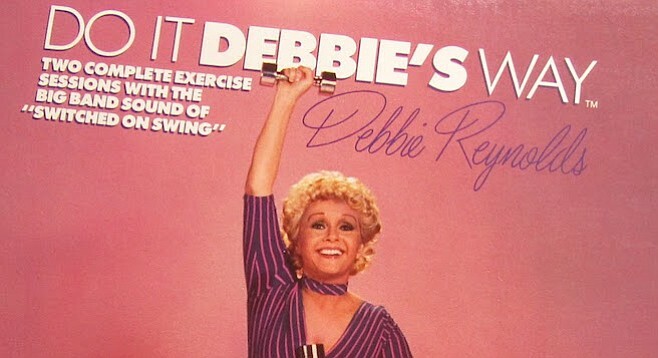 I'm actually very familiar with this underrated, charming, humorous gem of a workout tape, because my mother owned a copy. She used it so much she actually wore it out, and between the time Amazon launched and DVDs replaced VCRs I was able to purchase a new copy for her. This is actually a very entertaining fitness video; several of Reynolds' Hollywood gal pals join her on the set including Dionne Warwick, Teri Garr, Virginia Mayo, Pat Van Potten, Terry Moore, and a lazy (and chubby) Shelley Winters, who half-asses her way through most of the exercises. Speaking of the softly lit set, it features Grecian columns, a chandelier, the name DEBBIE in big letters, and a pink theme, inspired -- according to Reynolds -- by her many years spent at MGM studios. There's also lots of spandex and leg warmers galore; Reynolds herself is wearing a burgundy-colored unitard (that features a collar) and stirrup pants leggings. The woman is just too cute in this video. Even as a kid watching it, I could sense that Reynolds was down-to-earth and seemed like she'd be a funny lady to be around. "This is the lousiest exercise I've ever had!" she exclaims at one point and "I hate exercise!" gets shouted out during another moment, as well as "If I only had a hit record I wouldn't have to do this!" which makes me wonder if someone talked Reynolds into doing this tape for some quick cash. It seems pretty obvious that Debbie didn't aspire to become the next Jane Fonda, but she sure is having a lot of fun here. "Raise your hand if you slept with Howard Hughes!" says Shelley Winters (who then raises her hand, just before everyone else does because it's part of the move they're doing before breaking out in a fit of giggles.) "C'mon Shelley, you're not even trying!" says Reynolds. I guess it was no accident that Winters' spot was regulated to the back of the room. And the soundtrack of choice for these workouts? Big band music...mostly Glenn Miller. You gotta love it! The tape is 85 minutes long and features three workouts; one 20-minute segment and two half hour routines. Reynolds explains at her introduction that she tried other workout tapes but found them too fast, whereas she likes to do things that are slow and easy. The workouts feature a lot of floor work, stretching, and light aerobics -- nothing that would cause most people to break out in a sweat or burn a ton of calories, but totally suitable for those that require or enjoy exercise that's on the easier side. Now here's the best part about this gem of a video. From the reviews on Amazon, it actually has a cult following of women that claim they still work out to it to this day! They like the old school ease and the entertainment it delivers. Hey, whatever motivates people to get off the coach and move their body isn't a bad thing. Thanks, Doug. I did not know about her autobiography; maybe I''ll check that out one of these days. The Unsinkable Molly Brown Workout, ha ha. Happy New Year, Pam! God bless! It's so great to hear from you, Cherdo. Happy New Year to you, too! OMG, Pam! This is just too wonderful! A bunch of Old Hollywood friends hanging out together.